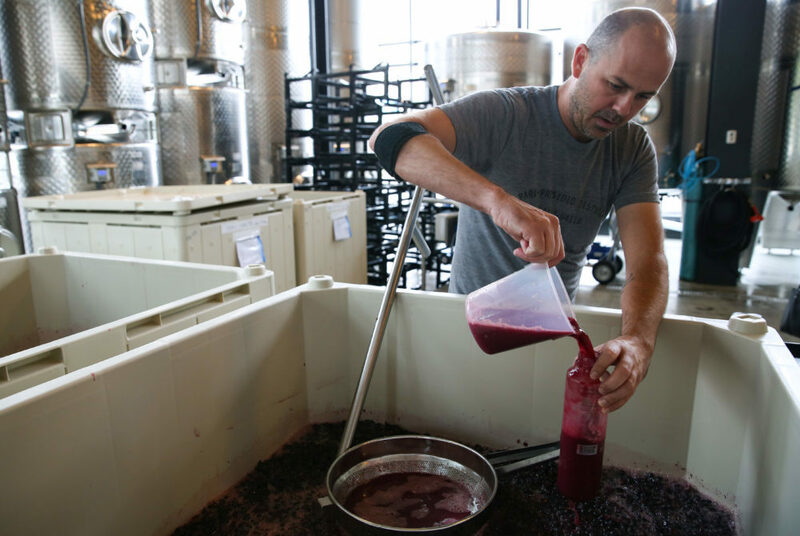 Conor McCormack, the head winemaker at District Winery, measures sugar as the wine ferments. For your next “Wine Wednesday,” you could pick up some bottles from Trader Joe’s or go straight to the source with a trip to District Winery. 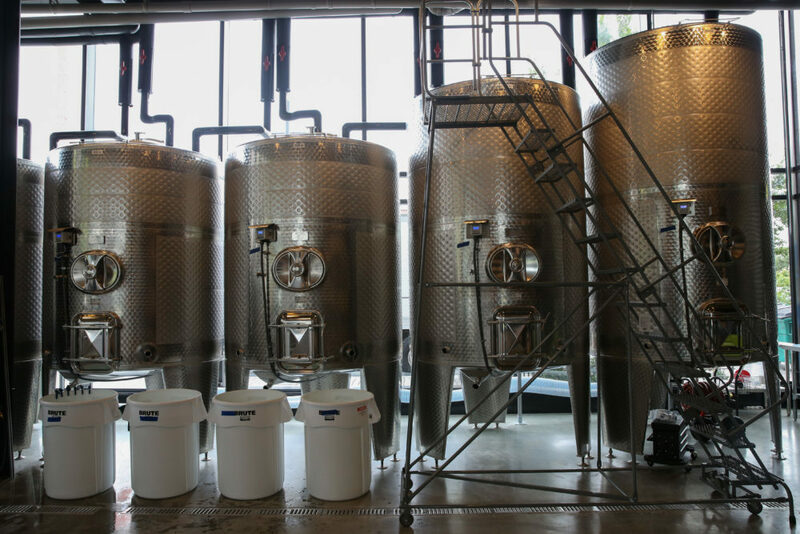 District Winery is the city’s first urban winery, housing every part of the winemaking process from crushing grapes to bottling the product. The 17,000-square-foot space opened last week on the Southeast waterfront at 385 Water St. SE. The winery includes a private event space, an outdoor terrace that looks onto the Anacostia River, a restaurant and a bridal suite with barrels and bottling equipment visible throughout the modern glass paneled space. 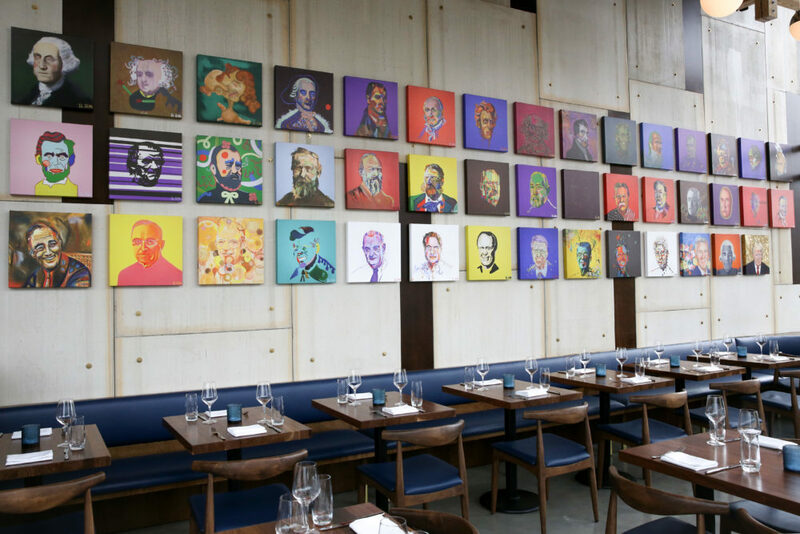 A collection of portraits of each president – shown in vibrant colors and styles along the back wall of the restaurant – adds a fun and welcoming vibe to the elegant space. Leventhal said the transparent nature of the architecture fits the interests of its key demographic — millennials. He said the largest growth in wine sales over the past few years is from millennials and that soon they’ll top overall consumption as well. Stainless steel tanks inside District Winery hold crushed grapes before they are fermented and turned into wine. “Millennials like experimentation, they like seeing creation and how it works and how it’s made, and they like urban environments, so that’s definitely part of the demographic that we’re after,” Leventhal said. The D.C. location provides access to people who want a wine tasting experience without leaving the city, Leventhal said. The next closest winery is in Silver Spring, Md. District Winery will be the first space to craft wine in D.C.
Leventhal and co-founder John Stires were inspired to open District Winery after having quick success with their first urban winery in Brooklyn. The D.C. space is twice the size and, unlike the Brooklyn space, features a restaurant, Ana, on site. Ana offers seasonal American fare to pair with District Winery wines, including crab beignets ($12) and pastrami spiced monkfish ($27). District Winery currently sources grapes from a variety of boutique vineyards, mostly in California. Head winemaker Conor McCormack said the space is able to accommodate a wide range of wines, from merlots to rosés, by keeping them in different temperature-controlled rooms for the different stages of fermentation. Ana, the restaurant inside District Winery, has a modern interior with presidential portraits that offer pops of color. Keeping the grapes at the right temperature, especially through transport, is key to the urban winemaking process, McCormack said. The grapes are kept in small boxes to prevent premature fermentation and are transported to the city in refrigerated trucks to keep them at the exact right temperature. McCormack said the grapes can travel for up to seven days this way while maintaining freshness. Immediately after the grapes are unloaded off the truck, they’re de-stemmed and the fermentation process begins. “It’s no different than if you were 100 feet from a vineyard,” McCormack said. The main production room of the winery houses bins of pinot noir grapes from Sonoma County that are fermenting and warming up to the right temperature. Yeast is added to the grapes before to absorb the sugar they developed on the vine and convert it to alcohol. Once no more sugar is left, a press will separate solid from liquids and the wine is poured into barrels where it stays for about 10 months. After another six months in bottles, the wine will be ready to serve – in May 2019. McCormack planned ahead and began preparing wine for a new location three years ago in Brooklyn, so bottles with the District Winery label are available now in the D.C. location. The first glasses of wine completely made in the District, however, won’t be available until 2018. McCormack said the D.C. location will produce roughly 6,000 cases of wine a year. Within the last 10 years, more urban wineries have been popping up because people have seen that it’s possible to transport the grapes without damaging them, he said. But there are tradeoffs to making wine far away from any vineyards. “You’re generally paying higher rent, but you have more access to people, you have more exposure,” McCormack said. The cost of transporting the grapes is also a big factor. McCormack said with the extra cost of travel, the wine for sale at District Winery can’t compete with $8 bottles of wine you find on retail shelves, but he wanted to “make sure the wine is still accessible” so it’s priced at $17 to $45 a bottle. Weekend tours of the wine production facilities can be purchased same day on-site on a first come, first serve basis for $25. They include samples of five wines plus souvenir wine glasses. 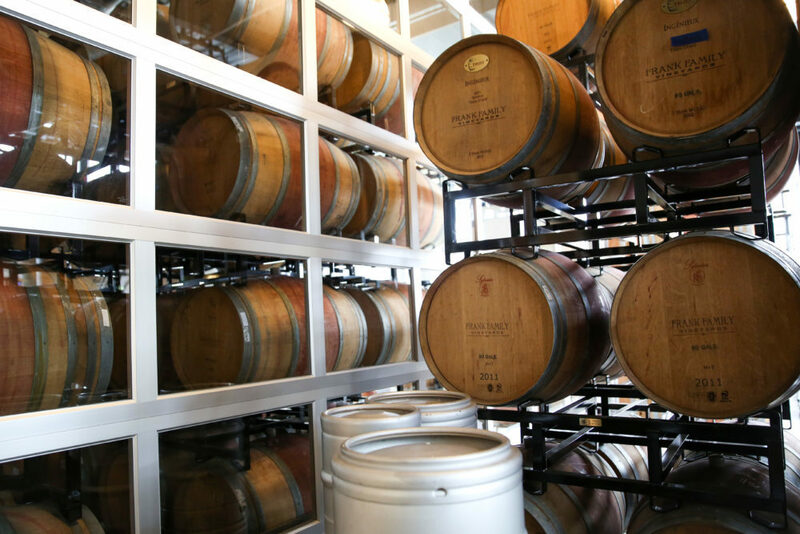 Given the long winemaking process, it would be challenging for another urban winery to open in the city for a while, Leventhal said.